My fellow Brownies, ask not what your franchise can do for you, but ask what you can do for your franchise. This is as political as this blog will be. I’ll just start off by saying the Cleveland Browns are in the best shape they’ve been since the NFL graced the city with the franchise in 1999. The Browns parted ways with a horrible head coach, Hue Jackson, and cancer of a coach, Todd Haley. 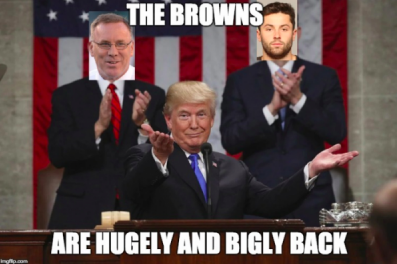 They took a chance on drafting a short, cocky, stud – Baker Mayfield and it paid off, BIGLY! The Browns finally look like a franchise that has a plan. In the past, they’ve been the team that has tried to build in free agency and through trades. Which, in the NFL, is very hard to do. GM John Dorsey is speaking softly, but walking around with a huge stick. Dorsey has 11 picks in this year’s draft and with his past draft history, there is no reason to doubt him. Because neither one of them would allow him to do what he does best, which is ball out. Mayfield is a gunslinger and you can’t give him a pair of water pistols and say go win us some games. Hiring Freddie Kitchens, my opinion, A+ move. A relationship between a QB and his HC/OC is the most important relationship on a football team. Kitchens has the respect of the organization and Mayfield. The offensive roster is the best it’s been since Bernie Kosar was slinging the rock. The Brownies are loaded with studs: Jarvis Landry, Nick Chubb, David Njoku, Antonio Callaway. I mean even Greg Robinson, who historically isn’t great, had a nice season when he took over for Desmond Harris in the final eight games of the season; the Browns should look to re-sign him. Moving past the offense, the Browns defense is full of young, growing talent. Starting off at the point of attack is Myles Garrett, who is the diamond of this franchise outside of Mayfield. The second-year defensive end finished the season with 13.5 sacks, 35 tackles and 12 tackles for loss. Doesn’t seem like a lot, well he’s ONLY 23 and is coming off an ankle injury. The new defensive coordinator, Steve Wilks, will be graced with a young secondary that he can mold, as he did in Carolina. Denzel Ward, who as a rookie, made the pro bowl and young safeties Jabrill Peppers and Briean Boddy-Calhoun will certainly improve under Wilks. But the talent on the defense is immense. Wilks will have Damarious Randall, Larry Ogunjobi, Terrance Mitchell, Joe Schobert, and Christian Kirksey at his disposal to terrorize the AFC North. All in all, the Browns are poised to be a threat in the AFC North in 2019. In a draft that is deep in the 3rd to 5th round, Browns have six picks. They have the future of their franchise with a head coach Freddie Kitchens, QB Baker Mayfield, stud defensive end Myles Garrett and a skilled shutdown cornerback, Denzel Ward. So this brings me back to the first line of the blog; Ask not what your franchise can do for you, ask what you can do for your franchise. Browns fans, the franchise has built a viable team that we can get behind and root for, with no bags on our heads. So all we have to do is support the team, the coaches, and JOHN “THE SAVIOR” DORSEY; let’s ride this bandwagon all the way to a Super Bowl.